In 2015, I travelled to Brazil’s Rio Xingu to see it for myself, I wanted to experience and understand it a little before the calamitous Belo Monte dam wipes out sections of the river and its many endemic fishes for good. This is, by extension, is the continuation of wanting to understand biotopes, what fishes live where and what do they do there. What I got was a startling insight – I found out that the Rio Xingu is all the tropical rivers I ever met, in one. We found slow water over sand, incredibly deep fast water, shallow hot pools of water over rocks, we found rock islands, fish havens isolated in the current, cobbled shallows and roaring waterfalls. All have their own species and many of those species are found only in the Xingu. 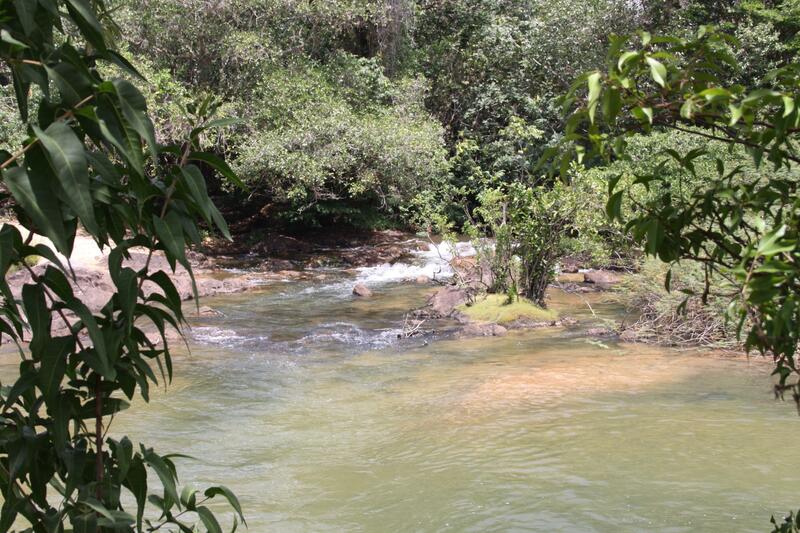 This is true of many biodiverse rivers, but in the Xingu the clear water and abundance of life turns it up to eleven. Just a few hundred miles of river throws up so many ways to make an aquarium. Over a decade ago now, Norwegian aquarist Håvard Støre Andresen nailed the classic Xingu igneous rock and sand biotope. This month’s species lives in a rather different world. Less current, no rocks and leaf litter and some sunken wood. But, nevertheless it is an indigenous Xingu fish like so many others in that place, it’s found a place to live and adapted. The pool in a river within a river. To the left is a picture of where it lives. It looks like a pretty stream bubbling through the forest and flowing through a placid pool. What is not apparent, even when standing there, is that this place is on an island in the mid of the Rio Xingu main channel. Only 30 metres away the river is charging past at such a rate that makes this little tranquil oasis seem entirely out of place. Indeed, the seasonal rains will come and the river will rise and rage. This little place may not be seen again, or it might just re-emerge next year and look about the same. I went snorkelling in this pool and managed to spot a fine specimen of one of the common Xingu whiptails, Loricaria birindellii. It was perfectly camouflaged in this leaf litter where dark and light leaves are scattered in about one and a half meters of water. An excellent nursery too, but I didn’t encounter any young this time. L010 is an interesting l-number from way back in the early 1990's when they were first introduced. For a while we thought it was Loricaria lata, but, as with many species of armoured catfish in that river, it turned out to be a species only found there. In terms of exports, this whiptail only turns up from time to time as smaller individuals and, as with all Loricaria, is a lipbrooder and the keeper should have a reasonable chance of breeding them with a good sized aquarium for a pair or a group with a male and some females.